The orange lights went up last weekend. When Lily was eleven months old, she would stare out the window at the orange lights. “Ights, ights,” she would say in her little baby voice as her chubby little finger pointed at the lights. The orange light neighbors were thrilled that baby Lily loved their Halloween lights. A lot of people have Halloween decorations up, but the orange lights are special. 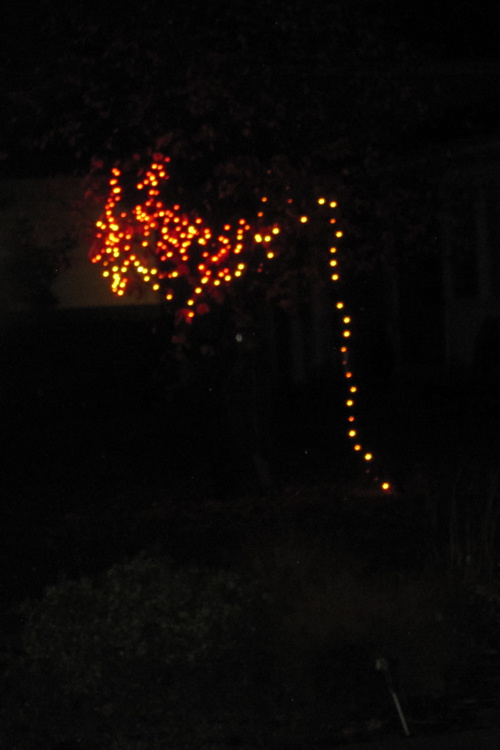 When the leaves turn colors and begin to fall off the trees, the orange lights go up on the tree. The time of year has come when it is dark at the girls’ bedtime. We have a little tradition. If they put on their pajamas and brush their teeth, we go see the orange lights. Last night the wet leaves clung to the sidewalk and the streets shone with rainwater. The girls had on their warm pjs and we headed outside. They skipped down the sidewalk ahead of Ed and me, and then we stopped for a few moments to gaze at the orange lights and the inflatable graveyard. This time, it was Emmy who was enthralled by the lights. Lily ran on home before Emmy was done. “WAIT!” she cried to me. So I waited with her, and when she had drunk in her fill she ran after her big sister. “WAIT FOR ME!” she yelled as she ran in her little pink light-up shoes, her nightgown flying behind her. I walked behind her in the dark. Just as they reached our door, the girls both yelled “MOMMY!” and ran back toward me, slamming me with hugs. The day had been so overcast, dark and gloomy and depressing. But now that nighttime had arrived, it seemed a little brighter. Aw, I remember “Ights!” She did that for Christmas lights, too — it was so sweet!